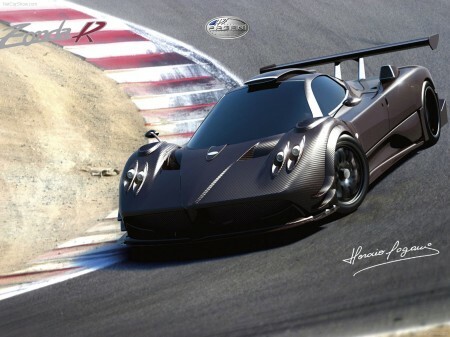 Pagani Zonda F — one of the fastest serial cars which have passed on northern loop of a Nurburgring. 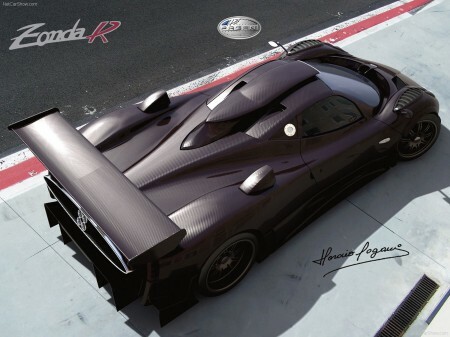 The new version Zonda R created especially for tracks-days, even faster: it is more powerful, easier, and the suspender and aerodynamics are adjusted. The story about the car should be begun with the monocot. It is executed from an carbon-titanic composite — at the expense of application of a new material ruggedness increased at considerable weight reduction. Front and rear stretchers are made from alloy chrome wheels, and external body panels from carbon MD System. For details of a suspender designer Horatio Pagani chose aluminum alloy AvionAl, for the structural elements keeping the engine and a gear box — alloy ErgAl. And even screws are used exclusively titanic, from firm Poggipolini. Thanking these measures dry weight of the car (completely filled and with the filled in liquids) makes only 1070 kg. The engine is established directly on the chassis, it AMG V12 by volume 6.0 liters, 750 h.p. developing capacity and a twisting moment of 710 Nanometers. Check points — sequential 6-step XTRAC 672 with a crankcase from a magnesian alloy, drive are switched by petals on a steering tube, time of switching of 20 milliseconds. To say that electronics disturbs to the skilled driver fashionably, but even on cars Formuly-1 various auxiliary systems are used. By them it is equipped by them and Zonda R. It is 12-channel system of traction-control Bosch Motorsport and ABS which options can be changed during movement. Calling in in boxes, it is possible to adjust a suspender and to change discharge angles of rear wings. Horace Pagani used racing rear wings from Ennegi, also at the car, certainly, the flat bottom and the rear choke tube. The range of options allows to vary aerodynamic characteristics in a wide range: At the maximum discharge angle of rear wings clamping force in 1500 kg is created, and minimum allows to be dispersed till the speed over 350 km/h. In cockpit Zonda R traditional for Pagani smart materials and carefully worked smallest details are interesting combined with racing asceticism and the maximum functionality. Custom-made armchairs Toora meet the newest requirements FIA and are compatible to the safety system of neck HANS. In case of failure of passengers keep five-dot belts and protects the built in framework of safety from alloy chrome-moldings. And now about dynamics. 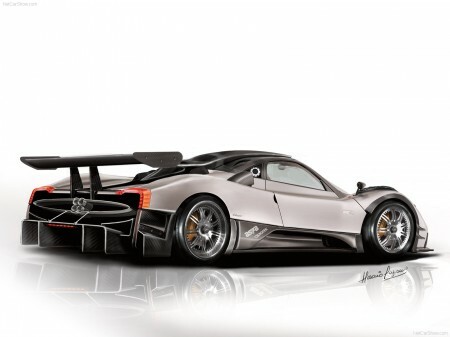 A capacity parity to weight Pagani R — 701 h.p. on ton. Thanks to it dispersal to 100 km/h occupies only 2.7 seconds, and carbon-ceramic brakes Brembo allow to brake even faster. Traction-control: 12 channel, manufacturer Bosch Motorsport. Transmission: semi automatic with a longitudinal arrangement of the engine, a drive gear rear with the self-blocked differential. Gear box details: XTRAC 672 with a magnesian crankcase, 6-step sequential automatic. Carbon-ceramic brakes: ventilated Brembo, with the hydraulic booster, 12-channel racing ABS from Bosch Motorsport Brake plates: front 380×34 mm, 6-porshenvye a caliper; rear 380×34 mm, 4-piston a caliper. Wheels: shod light-alloy APP; 19 inches lobbies, 20 rear. Tires: Pirelli P Zero Zonda R, lobbies 255/35/19, rear 335/30/20. Drivertrain: 4 independent wheels with double A-levers; shod suspension arms; screw springs and adjustable absorbers Ohlin’s. Structure: The central carbon-titanic chassis, the engine is its part; front and rear chrome stretchers, body panels from carbon fiber MD System. Sizes: length of 4886 mm, width of 2014 mm, height of 1141 mm, a wheelbase of 2785 mm Dry weight of 1070 kg. Safety: a cage of safety from steel chrome; carbon-plastic armchairs compatible with HANS; five-dot seat belts Dynamics: 0-100 km/h in 2,7 seconds; Max. Speed:> 350 km/h (217 mph). A parity weight/capacity: 1,43 kg/h.p.